Alden guitars are the result of a collaboration between UK guitar guru Alan David Entwistle (AL-D-EN) and one of Korea’s leading guitar companies! Alden is dedicated to the manufacture and promotion of the retro-vibe! 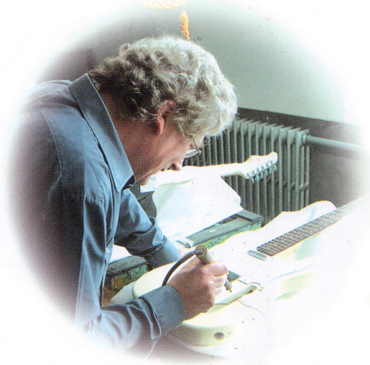 Alan Lester David Entwistle has been building guitars and designing pickups since 1962. He has worked on many high profile guitars over the last 43 years. His wealth of technical and personal experience in many genres of music have led to this unique range of instruments. Unlike other "committy designed" guitars these are the result of one mans dreams, one mans vision. His expertise has gone into every detail from the neck profile, body shapes, to the individual pickups. Each component pefectly matched by this amazing talent. They are as individual as the man himself. Alden guitars are inspired by classic instruments of the last 5 decades though thanks to Alans creative design input none could be even remotely described as copies. 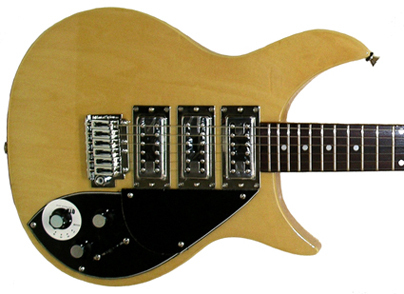 Several models are equipped with a real state of the art tone generator, the Entwistle QTX. Designed to take the guitarist to new highs in creativity. It really is a sound that is out of this world. Alden QTX tone filter control gives the player a truly versatile instrument with a useful array of switching options to explore. (QTX FREQUNCY SHIFT selects various nodal frequencies from any give pick up selected) With master volume and tone control, and the ability to switch pickups in any configuration that you wish, the tonal possibilities are endless. Feature 25 1/2" scale length, 12" finger board radius, Maple finger board, 22frets, Basswood body with flame maple top. Full contact knife edge bridge system. With humbucker-single-humbucker rock guitar high output pickups with QTX and 3way coil select plus the normal 5 way switch, it has 65 available tones. Neck zebra pickup slightly overwound from vintage spec with 12 fully adjustable pole pieces. Middle singlecoil with adjustable pole pieces and stressed field magnets. Bridge zebra pickup is a high output humbucker with 12 fully adjustable pole pieces. Volume/QTX/5-way pickup selector/3-way mini-switch for single coil selection. The name says it all; sun, sea, surf and echo saturated instruments from another era. 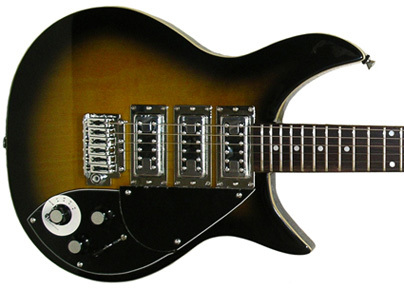 Equipped with three Surfmaster II fat sounding P90 soap bars with triple slide switch control panel on the upper bout. Bass cut, Mid cut and Phase switch plus a standard 5-way pickup selector, Volume- and Tone-control. Basswood body and maple neck with rosewood fingerboard. Bolt on neck. Roller bridge. JM tremolo. Chrome hardware. What can we say, dragged right out early sixties Italian and Japanese catalogue. This 4 pickup-trip to the lunatic fringe of guitarmaking actually renders 75 switchable sounds! Go on - Be different! Basswood body. Maple bolt on neck 25 1/2-scale. Rosewood fingerboard with mother of pearl block markers. Nickel hardware. Vintage Kluson type machineheads. Roller bridge and Burns Mark-8 tremolo. 4 Deco pickups plus QTX tone system. 4-way slide switch. Volume & tone control. To all appearances you would think that we´d found the Beat Backer under some bed in Liverpool, only it´s full contact tremolo and 5-way pickup selector gives it´s 21th century manufacture away. The sound is something else, fiitted with the unique QTX, 5-way rotary switch, those pickups give you all and everything. Basswood body & neck, rosewood fingerboard. Set in neck. Chrome hardware. 3 humbucker pickups, 5-way switch, QTX tone system, volume & tone control. Unbelievable lute-like electric folk rock sound! Basswood semi acoustic body with flame Maple top. Maple neck 25 1/2-scale. Rosewood fingerboard. 3 single coil classic alnico VX63 vintage pickups. Classic horseshoe tremolo. This little 3 Deco pickup semi has a monster range of vintage and modern sounds coupled with it´s smooth action Burns Mark-8 tremolo and roller bridge, the Chicago offers a whole different world of tone compared to most conventional guitars. Hollow single cutaway basswood body with maple top. Maple set in neck with rosewood fingerboard. Gold hardware. 1 volume-, 2 tone-controls & 5-way switch. Black finish. Capture the look, feel and sound of those classic 50´s G-brands with this amazing Alden Western Star archtop. Featuring a stunning Tennessee Orange finish over a flame maple top, full depth cutaway body, chrome finish hardware, vintage pickups and tremolo. The Western Star is perfect for retro guitar styles such rockabilly, jazz, western swing and blues. Mahogany Back and sides with maple top. Maple Set Neck. 22 frets, 628mm scale, 2 way truss rod. Rosewood Fingerboard with triangle inlay. Neck Binding ivory. Grover Type 3 Machine Heads. Roller Type Bridge. KD TREM System-tailpiece. Alden Deco Neck- and Bridge-pickups. 3-Way Switch, 1 x Master Volume, 2 x Volume, 1 x ToneBody Shape. Like the Western Star 1 but double cutaway thinline body with a traditional solid center block to reduce feedback and enhance sustain. Equipped with Nashville Star humbuckers, the Western Star 2 has a more rock oriented soundscape than it´s single cutaway companion. Great sounding rockabilly TV Cruiser with 2 split-coil MVH pickups and classic horseshoe Burns Mark-8 tremolo. Bound neck with thumbnail markers. Bolt on Maple neck 25-1/2 scale. Rosewood fingerboard. Basswood body with ivory-like binding. 1 volume-, 1 tone-control & 3-way switch. Gold hardware. Rock and country the TV Cruiser standard does it all. Naytoh body. Bolt on Maple neck. Rosewood fingerboard. 2 Alnico V tele lipstick & tele type bridge pickups. 1 volume-, 1 tone-control & 3-way switch. Nickel hardware. This guitar is a serious rock workhorse with raw and sheer driving tone and the fastest neck around. Basswood body with quilted maple top. Maple set in neck 24-3/4 scale with rosewood fingerboard. Chrome hardware. Kluson machineheads. Fitted with 2 ASC P90 pickups it has a dark, soulful response that also loves blues! Volume and tone control for each pickup plus a 3-way pickup selector switch. 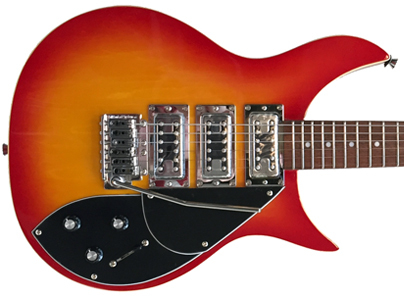 Great 80´s hardrocking axe with a bite! Basswood body. Quilted maple top. 25-1/2 scale. 24 fret. Rosewood fingerboard. Gold hardware. 1 humbucking and 1 twin singlecoil pickup. 1 volume, 1 tone control. 3-way selector switch. Alden new tremolo arm. Color Grey burst. Basswood body. 5-ply binding. Thru neck bass. 34" scale. 22 frets. Rosewood fingerboard. 2 open humbucker bass pickups. 2 volume- & 2 Tone-controls and 5-way switch. Gold hardware. Heavy bridge. Trans-black clear pickguard. Mahogany body and Bolt on neck. Rosewood fingerboard. Black nickel hardware. 34" scale. 24 frets. 2 humbucker pickups. Volume, tone, & balance comtrol. SE2A active circuit.